Over the last 12 years, I have spent countless hours tracing my own family heritage. It's been quite an adventure walking out on every branch of the family tree—of course some limbs are much stronger than others. The path may lead to a photograph, document, past home or lonely gravesite. The latter alone can be fitting touchstones to not only the life of a past individual, but can serve as a destination goal for the family history explorer. Much like reaching a mountain summit and planting a flag, the opportunity to actually put one’s own hand on a grave marker of an ancestor symbolizes more than just success after years of study and search. It is a reunification of relatives that are generations removed from one another. Just think for a moment about your future GGG grandson, or GGG granddaughter, 140-150 years from now yearning to learn about you and your life story. Thanks to the internet, I have certainly been aided in my searches with information, and more importantly, people. And these aren’t just ordinary, helpful people–they’re “flesh and blood.” Along the way, I have met several "distant cousins” that I never intended on meeting, let alone knowing. Like me, they have been on the quest in understanding family members and gaining answers to age-old myths and questions. Strength in numbers certainly helps in pursuits such as these…and so do the potential photographs, documents and heirlooms that connect two virtual strangers to a common relative 3, 4 or even 5 generations back in time. My grandmother, Margaret Haugh (center in black sweatshirt) with cousins walking the "outhouse boardwalk" located behind the Fenwick Island beach cottage. My blueprint for beginning the genealogy/family history process was a thesis project done by my father when he was in college. He graduated with a Bachelor of Arts degree from the University of Delaware in 1958 with his major in English and a minor in History. For the minor, he spent considerable time in his final spring semester interviewing his grandmother (Zitta Cook Warfel) and great aunts, all part of the larger Cook family of cousins. This close knit family began populating the small town of Delaware City, Delaware in the late 1850's. The town itself is located in New Castle County along the Delaware River, south of Wilmington. I have vivid memories of the Cook family “Cousins’ Club,” a bona fide membership group that was vibrant throughout the balance of the 20th century. They held annual reunions in the form of Christmas and Easter parties. Each summer, a hay wagon loaded with Cooks departed town en route to nearby Augustine Beach on the river, for an annual picnic. And this same group also spent plenty of time together at a shared beach cottage dating back to the 1940's and located in Old Fenwick Island (Lea and 138th streets). While adults played cards and enjoyed alcohol libations until the wee hours, the kids were "packed in like sardines" on surplus army cots in the attic, sleeping head to toe. The Cook family progenitors included a German carpenter (Wilhelm Koch) and a French laundress (Catherine Sebastian) who originally arrived separately in America in the early 1850’s and by 1859 found themselves married to one another. My father also attempted to trace his maternal grandfather who had come to Delaware City from Yorktown, Indiana. He was in the US Army Coast Artillery and served at two nearby forts. One of these was Fort DuPont, located directly across the canal from his future wife's home. Dad enjoyed limited success with this Warfel family search because his grandfather Herman had passed ten years earlier in 1947. He had to rely upon his grandmother, mother and aunt for information. Unfortunately there were only loose ties to the Indiana family, and eventually these were lost. Dad’s paperwork, stories and collection of photos have provided great guidance nonetheless. I have been able to validate plenty of facts and tales thanks to my Uncle Bob (my father’s brother) and plenty other living relatives from this Cook clan. As for tombstones and church records, most of these ancestors were connected to the town’s Catholic church and its old and new cemeteries–the latter containing the graves of my father, his parents and his maternal grandparents. Unfortunately, documented history and heirlooms were scant over on the other side of the family involving my dad’s father, Edwin A. Haugh, Sr. He was a career military man known better to friends, family and military chums as “Blondie,” and supposedly possessed a quick wit and impeccable sense of humor. The master storyteller died in 1970, when I was just three years old, but I have a few memories and artifacts from him. In particular, I still have the metal red fire engine riding toy, which I still have in the attic above my garage. My grandfather “Blondie” had been my father’s life hero. A veteran of World War II, he spent several grueling months in German POW camps after being captured on December 15, 1944 in the Battle of the Bulge campaign. My dad knew relatively little about his father’s people, as "Blondie" didn’t provide much thanks to losing his own father when he was just 22 years old in 1936. My grandfather was somewhat estranged from his mother (Jennie Williams Haugh) as well, a woman of Welsh and English background. 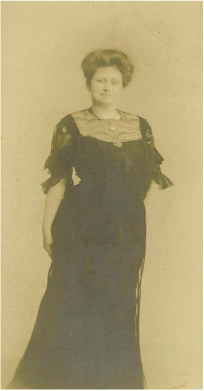 Jennie Williams (Haugh) was born in Pottsville, PA, and lived out an interesting life of ups and downs: an apparent “rags to riches to rags to riches to rags story.” Fortunately, “Blondie” was born during the second “riches” phase. His father Albert Ambrose Haugh ("Al") was a well-known and respected newspaperman and editor in the Philadelphia, and later Camden, NJ, newspapers. All my Dad could tell me was that he knew Al Haugh was born in Chicago, but had some connection to Toronto where his (Al's) mother was from. Both of Al’s parents were supposedly Scottish, as was the origin of our name which roughly translates to the noble and romantic “Wanderer of the Meadow.” To this day, it seems that the surname commemorates an ancient namesake ancestor who could have been somewhat of a slacker, but I digress. “Blondie” didn’t have much contact with Haugh kin, save for childhood remembrances of his grandfather Haugh’s visits, and occasionally a cousin from Canada. Al's father was a steamfitter by trade and supposedly this man possessed a thick accent. He also had a disturbing penchant for requesting his grandson to help clip his toe nails upon visits to the Camden area. For me, this quickly had become a history quest for me of epic proportions. I began to work backwards, having the knowledge that my grandfather was born in Philadelphia in 1914 and grew up across the river in Camden, NJ. Like Herman Warfel (his future father-in-law) Haugh wound up in Delaware City due to an army assignment at Fort Dupont, and served in the Coast Artillery as well. He met and married a local girl, Margaret Warfel, my grandmother--whose parents had done the same thing basically two decades earlier. “Blondie” told the story that he enlisted in the Army at age 17 in an effort to get away from his tyrannical mother who publicly embarrassed him one day in front of a girl he had been interested in. She agreed to sign off on his enistment papers, but she told the recruiter that she would only do so if he would be stationed within a 30-mile radius of her home of Audubon, a suburb of Camden. I knew of no relatives living in Chicago, Toronto or Pottsville. It’s not really that the family was lost, just that my direct ancestors lost themselves from their greater clan through time, either by accident or design. My best bet for this Haugh side resided in two elderly relatives still living in Audubon (NJ). This couple was best friends with my Haugh grandparents, and I had known them since childhood, as had my father before me. Leonard Jones regarded “Blondie” as practically an older brother, although they were actually first cousins whose mothers were sisters from Pottsville, Pennsylvania. The Williams sisters later moved to Philadelphia with their parents who would work in the green grocer business at the famed Reading Terminal. A Welsh immigrant, Jennie's father (William B. Williams) started out as humble huckster who made treks to Philly earlier in life before opening his own produce store in Minersville (PA), just west of Pottsville. I found all this out on my first visit…along with plenty more regarding my apparently demented grandmother, Leonard’s Aunt Jennie. I started making regular three-hour treks to Audubon to see Uncle Len and Aunt June, a few times staying in their guestroom overnight between visits to the Camden Historical Society. During these trips, Leonard (with June’s assistance) told me stories relayed by his mother about the Pottsville Williams branch. They even had found packed away, a dingy leather book filled with tin plate photos and daguerreotypes. A few were labeled, but most were not. Luckily, one photo that was identified on the back was that of John Greenwood, Jennie's grandfather. I would discover through my research that John Greenwood had come to America from near Manchester, England with two young daughters after being widowed in 1858. He would join company D of Pennsylvania’s 96th Regiment and serve with distinction throughout the Civil War. Greenwood took part in several famous battles including: Antietam, Chancellorsville and Gettysburg. But most fascinating of all is the fact that Greenwood participated in the lesser known Battle of Crampton’s Gap, part of the September 14th, 1862 Battle of South Mountain which took place right here in my home county! John Greenwood wound up getting his US Citizenship in return for his military service. What a thrill it still is to walk in his footsteps at Cramptons Gap and also at Gettysburg, where his name adorns the bronze plaque on the Pennsylvania Monument listing the 96th Regiment battle participants. Iconic Library of Congress collection photo taken by Matthew Brady in 1861 of the 96th Regiment in camp quarters. Len and June gave me John Greenwood's picture and the actual citizenship paper to boot. They also furnished me the wedding certificate for William B. Williams and Mary Greenwood's 1878 wedding and eventually the full album of tintypes. In giving these to me they stated that they had no idea who these people in the pictures were. However they were so pleased and proud to see me find out more about these people in two months than they had (with these pictures in their possession) in over 60 years. In 2011, I actually spent a day in Pottsville and nearby Minersville. I drove to addresses of old family residences and went searching for gravestones. I had found through research that my GG Grandfather William B. Williams was buried in a Methodist Episcopal Cemetery in Minersville. I had received word from a local researcher that it had been in disrepair and a recent clean-up effort had been performed by scouts of some kind. I searched desperately and never found William B. William's stone. I did however find that of his father-in-law John Greenwood, so I was quite delighted having had no clue where he was even buried. My last visit with Uncle Len Jones (seated) in 2011 before his death in 2013. June is on the left and my Uncle Bob Haugh (my father's brother) is on the right. Back to the Haugh’s, I wanted to search for my great- grandparents gravesites in the Audubon area. I convinced my dad and his brother (my Uncle Bob) to visit Len and June in the summer of 2003. Len had thought the Haughs ("Al" and Jennie) were in New St. Mary’s Catholic Cemetery, a huge burying ground with the requirement for small, flat uniform headstones. Of course, my error came in thinking that Len could lead us to their grave(s) without problem. This was made worse because it was a Saturday afternoon with no staff in the cemetery office for assistance. Our party of five searched for two hours with no luck…scouring hundreds of stones. We gave up our quest, quite frustrated. The following Monday, we found out why the search was so difficult as there was no tombstone marking the plot location in the first place. Along the way, we were excited to learn that the family plot contained Al, Jennie, Al’s father Ambrose (he of long toe nails) and two other mystery people. Of these, one was a sister of Jennie’s named Amanda Baurle, whose obituary resided in the leather picture book. I would, in time, find out that Amanda had died of a freak accident caused while dancing at church benefit dance back in 1928. Someone had accidentally dropped a drink on the dance floor near where Amanda was located. She apparently slipped and fell, hitting her head on a piano on the way down. This sent her into a coma. She died two days later, never regaining consciousness. Amanda (nee Williams) and Joseph Bauerle, Sr. This sad story was relayed to me in 2006, after receiving an email response from a query I had put on a genealogical website back in 2003. This came from a gentleman named Rob Hogan living in White House, Tennessee. Rob’s grandfather, Joseph Bauerle was the son of Amanda Williams Bauerle, a sister of my great-grandmother Jennie. Amanda was Rob's great grandmother. Here was a new distant cousin for me, but more importantly, a compatriot in family history. Interestingly, Len and June knew Rob’s grandfather intimately in earlier days. 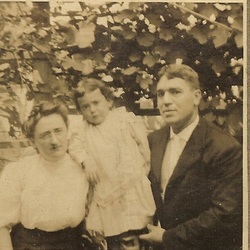 Len's mother (Cora), and father acted as surrogate parents for Rob’s grandfather. Rob shared with me this story, and many more regarding his research forays into the Pottsville Williams family. We talked for hours via phone, and were able to simultaneously send photos to one another via email and help each other identify various family members. I'm sure our great grandmothers could not have imagined great-grandsons comparing notes some 80 years after their sister Amanda’s untimely death. This meeting of a cousin truly closed some history gaps for me, and at the same time, evoked other questions and family mysteries. For Rob, I was able to provide many facts regarding the family, along with some great photos. Most importantly, I helped solve a riddle that had perplexed him for quite some time–the location of his great grandmother’s grave. Before his death in 2004, my father asked me to make arrangements one day for placing a tombstone on the grave plot of his Haugh grandparents and great-grandfather in New St. Mary's Cemetery (Bellmawr, NJ). This came to fruition in late 2005. I combed the Camden Courier newspaper microfilm and was fruitful in finding several articles about my great-grandfather Al Haugh. His obituary was front page news, as was his funeral. I certainly received more than the average obit of the time, along with the clarification that he was born in Chicago but grew up in Toronto before coming east to Philadelphia. I would eventually sure up the Toronto “connection," as this came unexpectedly late one night as I was sitting at my home computer in the luxury of home. I had stumbled upon a rare, online reference in response to a Google name search. I simply plugged "Al" Haugh’s parents: Ambrose Haugh and Elizabeth Jane Patterson. This site was the result of a Canadian research project that studied wedding abstracts from Canada newspapers during the span of 1877-78. Lucky for me, and unbeknownst of course, 1877 was the year my GG grandparents were married in Toronto, Canada. The abstract was a “genealogy jackpot” as it stated the names, nationality and the native home locations of the bride and groom’s parents. Ambrose Jason Haugh was from Waterford County, Ireland. His parents were listed as James Haugh and Sarah Backas. This was clearly "a needle in a haystack" for me! And quite a surprise as well, because we had always been under the impression that our Haugh line came directly from Scotland. As a consolation, we confirmed that Elizabeth Jane’s Patterson's family was Scottish, and residing in Toronto. I would later find that Al and his brothers would live with their mother's brother's family after her untimely death. I attended an Irish genealogy workshop in May of 2006, held by the Historical Society of Frederick County. After the lecture, I proudly told the keynote speaker of my recent "Irish Roots" internet find, and she was none to pleased--jealous of my good fortune. She had actually spent three decades traveling overseas and searching through Irish town, church and tithe (tax) records to find her ancestors, with little success until recent years. I playfully added the quip that I must simply have the "luck of the Irish," at which she rolled her eyes and started conversation with someone else. Even though this lady successfully brushed me off, I followed up on a book recommendation she had made during the session--Tracing Your Irish Ancestors by John Greenham. Once in hand, I dove into this comprehensive work, compiled by a gentleman formerly attached to the Genealogical Office in Dublin who later served as project manager with the Irish Genealogical Project (IGP). Within a specific chapter focusing on internet use, I learned that the Waterford County Library had an extensive amount of records online. I found the said site and plugged in James Haugh’s name in a death register index. To my astonishment, there was a report of his passing in 1882 in a home town of Portlaw, Ireland. 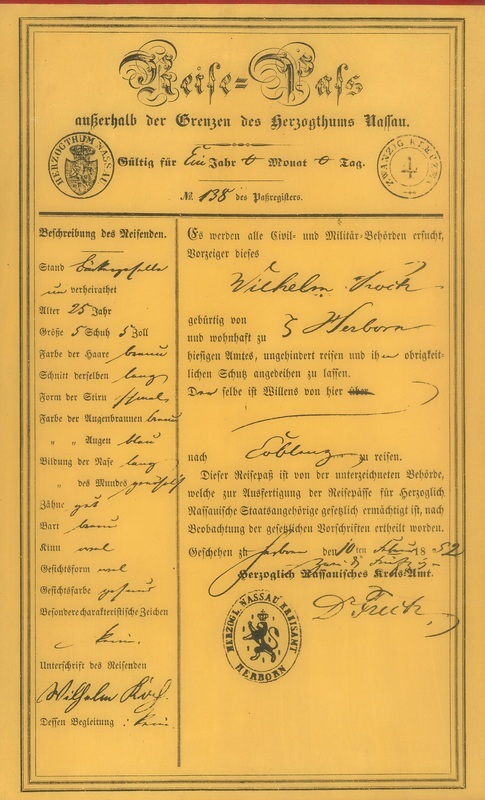 Then I found his wife’s report of death in 1896. The Haugh's were listed as former shopkeepers, and lived on Brown Street. I would later learn that the crossroads adjacent their townhouse/business was known as Haugh’s Cross. I followed-up this find by having a research firm in Waterford survey local records on Ambrose Jason Haugh's family. Their report gave me important church records (baptism/marriage/death) and in a few cases, burial locations. Although I have never made it to Portlaw myself, I was able to guide my Uncle Bob (Haugh) and family there for a visit in 2009, following the wedding of my cousin Margaret (Haugh) in Ireland. They took plenty of pictures, capturing the town square, the former Haugh residence, and Haugh's Cross. I had also given instruction to successfully get them to the nearby St. Mary's churchyard in Kilmeadan, location of the final resting place of my GGG grandparents James and Sarah Haugh. I had solved the Toronto connection, but not the move to Chicago. I knew they were in Chicago in January of 1884, the time of "Al" Haugh's birth. There were plenty of Haugh's listed in the Chicago City Directory of that year as well. I found the Ambrose Haugh family listed in some of these directories as well. Perhaps it was relatives that precipitated the move from Toronto? This postulate has not been proven yet. I eventually located an immigration paper for Ambrose Jason Haugh within the Ancestry.com database that stated he had left Canada in 1881 for work purposes. The "Windy City" would only serve home to "Al" for a decade. While there, I found that Elizabeth Jane (Patterson) Haugh had died in 1887. This came after months of searching cemetery records and vital information databases from Chicago and Toronto. 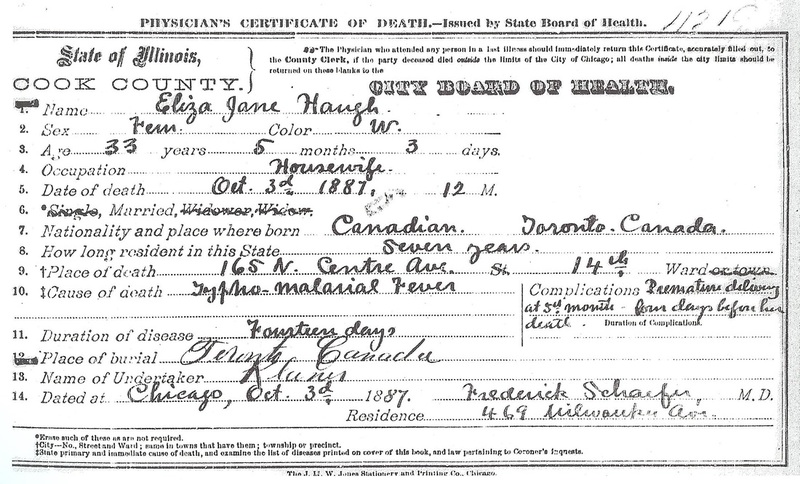 In an obscure state of Illinois composite list, I located a reference to a death certificate for an Eliza Jane Patterson from an online State of Illinois death register database. It took me a few tries, but I was able to point a staffer to a copy of this actual death certificate from deep within the bowels of the Cook County Clerk of the Court's Office. And for a modest fee of course. My great-grandfather, Al, was only three years old when his mother would die of malaria, complicated by a premature childbirth. The baby died as well. This must have placed quite a heavy burden on Ambrose Jason Haugh, having three young boys to raise, while having to earn a living. It now made perfect sense why the Haugh children were sent back to Toronto to live with family. Getting back to the Toronto family, my father recalled his family receiving Christmas cards from a great aunt, named Alice Haugh, in Toronto when he was a kid. He never met Aunt Alice, but was told at the time that she and her husband owned some sort of department store or business in Toronto. Alice was the wife of Jason Alexander Haugh, Al’s oldest brother. My dad also had knowledge that these same Haugh’s had been very successful with the creation and resale of workman's overalls. 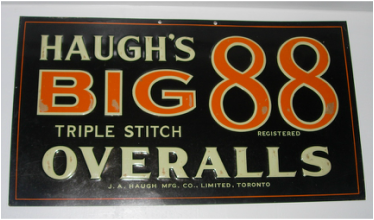 In time, I would discover these to be “Haugh’s Big 88’s,” a very popular brand of Bib overalls in Canada, boasting the marketing slogan: "Work clothes that laugh at hard work." With this information, I starting searching for Haugh's products on eBay, and actually won several auctions, including two advertising signs and a pair of the overalls themselves. I have since added to the collection with advertising cards and a large electric advertising light-up store display. In 2007, I saw one of these advertising signs reappear on eBay, offered at auction by a seller in Iowa. I put an early bid on the sign, wanting to buy it for my uncle for a Christmas present. Two days later, I noticed that another bidder with the name “A. Haugh” and from Ontario, Canada was bidding against me. We both lost out to a sign collector from Michigan who had no interest in selling. However, I actually "won" something better through than the sign through this episode--actual "Canadian" Haugh family relatives! I sent an email to my fellow bidder and introduced myself, expressing why I had bid on this item. The next day, I received a joyous reply from a young lady named Ashley Haugh--a cousin. 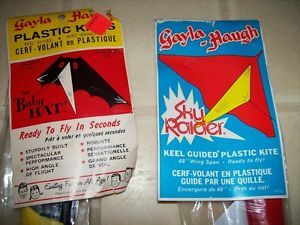 Kites from the 1960's and 70's, among the many offerings from Toronto's Haugh's products Ltd.
Ashley was the great-granddaughter of Jason Alexander Haugh (older brother of my great-grandfather Ambrose “Al” Haugh, the newspaper man). She told me all about the family business that began in the early 1900's and eventually transitioned from overalls into vinyl pool lining when her grandfather (Gordon Alexander Haugh) became an early patent holder for the polymer called vinylite. Eventually, other vinyl novelty products were produced by Haugh’s Products, Ltd. Such as kiddie inflatable toys like water-wings, Popeye punching bags, and kites (featuring the famed Baby-Bat). They also produced aluminum Christmas trees and oxygen tents. More recently the company would dabble in pool supplies and fireplace inserts before selling off to the Jacuzzi company in the 1990’s Soon after learning this fact, I bought myself a Haugh’s propane decorative log set (on eBay), which I proudly use in my fireplace. (c.1895) Photograph of three Haugh brothers: Ambrose "Al" on left, Jason Alexander (center) and James (right). Ashley developed an email address list and I found myself replying to a slew of Haugh cousins across Canada, with none having any knowledge of family origins back to Portlaw, Ireland. I quickly became a history teacher, having the great privilege to talk to some of these fabulous folks on the telephone as well. It was an awesome experience meeting relatives I never knew I had. Best of all, we shared a last name, and common ancestors. My greatest takeaway included digital files of family photos and distant gravesites--best of all, a picture of Al Haugh and his brothers as young boys. I also would get the chance to have dinner with Ashley's father, Gord Haugh in 2007, while he was visiting Washington DC on a business trip. Gord's father was the one who developed and grew the vinyl business. My brother Tim joined us in this surreal experience of sharing a meal with a newly met person who owes their earthly existence to the same ancestors you do. We certainly gave toasts and thanks to Portlaw, Ireland's Ambrose Jason Haugh and his Canadian wife, Elizabeth Jane Patterson, that night. (L-R) My brother Tim Haugh, Gord Haugh and Chris Haugh in 2007. With Mom (Mary Galloway Haugh) on the occasion of my first birthday, dressed in the color of the Emerald Isle of course. Without a doubt, Mary Galloway has always been my greatest fan and cheerleader, and still is. I couldn't ask for a better mom and I love her dearly. She grew up a "city girl" in Wilmington, Delaware, and worked most of her career as a medical technologist, emergency room stat lab supervisor and hospital administrator. One thing I have known since birth is that my mother’s family hailed from Ireland. I never really thought hard about my mom's ancestry, because it seemed at surface value rather easy to figure out. There were only a few generations separating original immigrants to America ,and their time spent here seemed well-documented and verified by relatives who lived long lives. And I have had the pleasure of knowing and interviewing many of them. In my early naivete, I just assumed the Irish lineage was clear-cut, especially with a name such as Galloway. The family, as I knew it, was proud of this heritage, as well as their Catholic faith. Or though I thought. My mom was the youngest of three children by William Francis and Alice Galloway. Like my father's roots, I actually had better knowledge of my mom's maternal family. My grandmother Alice had the maiden name of McTague, and lived as a child on various tenant farms in the mushroom-laden terrain of lower Chester County (PA). After the death of her parents, she spent her teenage years in the small borough of Kennett Square. Alice’s paternal grandfather (Michael McTague) had come to this neighborhood as an Irish immigrant from County Cork arriving in the 1855, likely precipitated by the Great Potato Famine back home. He would first land, and marry, in Philadelphia, but would find his way to the western "suburbs" and own a modest home on the road leading south out of Kennett Square. Michael McTague's son, John (Alice's father), attended school here and helped with family farming endeavors, He also would experience an apprenticeship to a brass moulder, and later would be employed as a brick maker. Former home and farm of Quaker Joel Walker Hoopes of New Garden Township. John J. Quill was working here shortly after his arrival in America in the 1850's. Mary Galloway's maternal grandfather was another man of Irish extraction named John J. Quill, born 1831 in Millstreet, Ireland (County Cork). Quill can be found in the 1860 census living in nearby New Garden Township (Avondale). Somehow, the area known as Kaolin is involved as well. I quickly learned that Pennsylvania consisted of a more complex system of municipal designations and local government makeup. Enter in the addition of borough's and townships to larger cities and towns. John J. Quill immigrated in 1856 and would work his life as a farmer. He had siblings and relatives in the area and was further assisted by the kindness of the Quaker population in the area. I searched and found the Joel Walker Hoopes farm where he worked, and lived, in 1860. Today this property is in the center of a prestigious golf club and community known as Hartefeld National. Mr. Hoopes likely helped young John Quill (who would marry another Irish immigrant named Julia Desmond) purchase a farm a few miles away near the famed Mason-Dixon Line in the Hockessin/Mill Creek Hundred area in Delaware. Today, the ruins of this farm can be found within the White Clay Creek State Park and Preserve, part of the Delaware State Park System. John Quill died in 1919 and the farm eventually fell out of the family. In the 1960's, this property and others had been bought up by the DuPont Company and were ready to be sold back to the state in an effort to build a large dam project, creating a major watershed for New Castle County. Opposition from concerned citizens, the Delaware Sierra Club and Pennsylvanian land-owners not wanting to sell needed properties helped thwart the major engineering project which would have put the entire White Clay Valley under 150 feet of water. In 1984, the DuPont Company donated 1,350 for the use of a park and nature preserve. In 2010, I had the good fortune of helping rangers lead an interpretive walk to the ruins, quite a thrill for me to have my picture taken standing within the confines of my Quill GG Grandparents house. As I stated earlier, the history on this branch is pretty clear-cut going back to the immigrations from Ireland. My McTague great-grandparents, McTague GG grandparents and Quill great-grandparents can be found in the same cemetery in West Grove, PA. I have been aided in my genealogical studies by the fact that three Quill siblings accompanied progenitor John Quill, and the same goes for his wife Julia Desmond. I have recently found Michael McTague had kin in the greater Philadelphia area as well. Thanks to another online "genealogy post" of my doing, I have been in contact from time to time by a distant Quill relative living in Massachusetts, who has been methodically vetting the early Quill branch of my family tree. My maternal great-grandmother was Mary (Quill) McTague. With husband John working as a tenant farmer and brickmaker, the couple and their five daughters lived on both sides of the Pennsylvania and Delaware border, hopping between Chester County (PA) and New Castle County (DE). At one time, family lore says that they actually lived in a house that was on the state line--with the back half supposedly in Pennsylvania and the front in Delaware. The Quill/McTague offspring of this family can best be described as being devoutly Catholic and blessed with longevity. My grandmother (Alice (McTague) Galloway) went to church every day, and once held a job cooking for priests. She lived to be 91. Three other sisters lived well into their 80’s, while Alice's oldest sibling, Julia, outlived them all, dying in 2000 at the age of 106. I remember these ladies quite well, especially the time when all five took a trip together to Florida in the late 1970’s. They drove and stopped at our home in Frederick for the night. I can’t really say if this was a planned visit or perhaps they mistakenly thought we were located more conveniently on the path back from “the Sunshine State” and their return destination of Wilmington (DE). I now think they could have just gotten horribly lost. Either way it was fun to experience this “aunt infestation." I just wish I had an interest in family history back then at age 10, I could have learned so much from them. Ironically, the McTague girls’ parents had died relatively young--their mother died at age 48 in 1918, and their father at age 52 in 1920. My grandmother was 13 at the time of her father's death and there was talk of her possibly having to go into an orphanage. Her oldest sister, the fore-mentioned Julia, came to the rescue and helped raise her sister into adulthood with the assistance of an aunt. After my grandfather died in 1975, Julia and Alice were reunited under the same roof again, and would live and care for each other for the next 20 years. 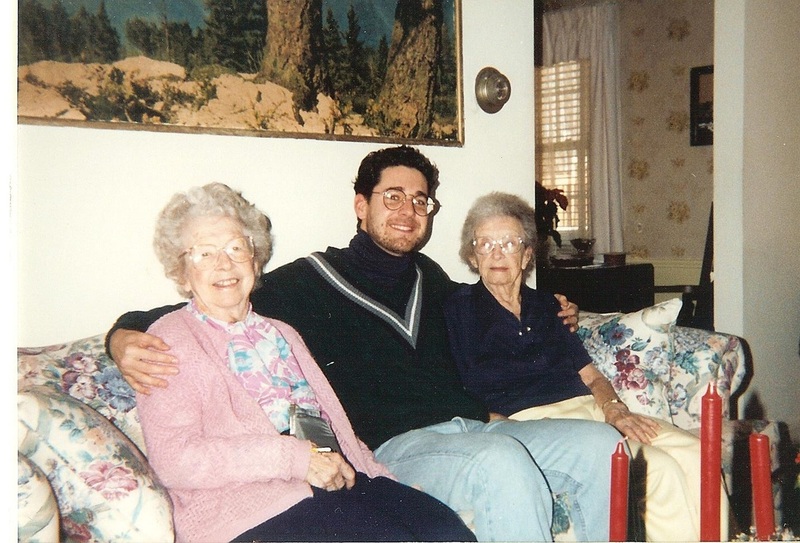 "A thorn between two roses," Alice (McTague) Galloway (1907-1998) on left and Julia (McTague) McGovern (1894-2000) on right. Photo taken in 1994. The other side of my mother’s family is a bit more tricky, complicated and colorful. Alice McTague married William Francis Galloway in January of 1928 in Kennett Square. I had always thought the Galloways had always been a Catholic bunch, as my grandfather (lovingly known as Pop-Pop) was a Eucharistic minister and “big wheel” within the Knights of Columbus organization. They lived in Wilmington all of their married life of 47 years until his death in March of 1975. As I got deeper into my research on the Galloway family, I was astonished to learn that William F. Galloway’s father had converted to the religion after marrying Miss Martha Haggerty (my grandfather’s mother). In the process, my renegade great-grandfather, Nathan Galloway, became ostracized and disowned by his family. Now Nate was a large, “rough and tumble fellow” who worked as an industrial welder and reportedly spent weekends in South Philadelphia, drinking and fighting in bars. He somewhat resembled baseball legend Herman “Babe” Ruth, and seemed to possess similar social graces. I was most fascinated in how my great-grandfather got to Philadelphia, courtesy of an on-camera interview conducted with my Uncle Bill Galloway in 2006. He told me that Nate would leave work on Friday afternoons (after work) and head to Philly on a bicycle, returning Monday wearing a brand, new suit of clothes (because previous ones had been destroyed in brawls). I postulated that his upbringing, or lack thereof, was likely responsible for childlike behavior in adulthood. This tale was funny on the surface, but sad deep within--especially for his wife Martha and son William (my grandfather). With further research, I came to understand the possible roots for Nate’s alcoholism and erratic behavior--so different from the personality of my "straight-arrow" grandfather. It resided somewhere between “the chicken and egg” and culminated with the consequences of marrying a poor, Catholic girl. I understood the prejudice that existed with Catholics at that time (c.1900) but it all came into focus when I found out what “Poor Nate’s” father did for a living as both my ancestors seemed to be "battling demons" literally, and figuratively, throughout their lives. 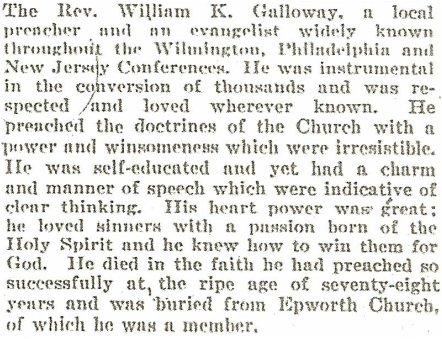 Nathan Galloway's father, William K. Galloway, was a highly respected evangelist and minister in the Methodist Episcopal Church. He regularly played the role as a headliner at camp meetings and revivals held throughout the mid-Atlantic region during the late 1800’s up through his death in 1914. As a minister, William K. Galloway moved his family regularly and only rented houses. Nathan was the sixth of eight children (the older of two boys). It appears that Rev. Galloway put far more time and travel into his profession than his son. Perhaps it was a lack of "father-son time" and role modeling, leaving the job of parenting to his wife? This woman (Lydia Galloway) may have been great with the family's first five daughters, but became perplexed with a big boy like Nathan, who I'm sure was more than a handful in his youth. I will never know for sure, but it seems that Nate's brother John (and the youngest Galloway child) was the recipient of the parental nurturing and support Nate missed. John, who would take up the ministry like his father, and become equally successful in his calling. I wanted to find out more about William K. Galloway. His middle name still eludes me, as I'm thinking it to be an old family name. In my study, I discovered that he had initially followed in the profession of his own father, Isaac Galloway, a blacksmith living in the Colerain area of southeastern Lancaster County. After working with "fire and brimstone" in his early vocation as a blacksmith and furnace worker, William K. switched to preaching about these elements. This transformation took place around the time of Nathan's birth in the mid 1870’s. I was able to acquire more info on my GG grandfather William K. and his son John from the United Methodist Archives and History Center at Drew University in Madison, NJ. Again, I could only think one thing after reading this passage--It’s no wonder that Nate was ex-communicated for marrying a Catholic girl! I found it quite ironic (and hypocritical) that William K.'s own mother (Annie Russell Galloway) had been a faith covert herself. Through further research I discovered that she came from a Quaker family! The question now: Did Nate do this by design to strike revenge at his father (or mother), or did it occur by happenstance, thus causing his father's ire and disdain? Either way, the reaction by the family fueled Nate to convert to Catholicism--an act that surely humiliated his father greatly. I also discovered (upon finding my grandfather's birth certificate) that Nate had originally given his son the name William K. Galloway. However, this at some point his middle named was changed to Francis (William Francis Galloway), perhaps an effort to snub Nate's father even more. Quite a tangled mess, and one time couldn't solve. Another research direction took me in search of that “rosary-toting” maven who lost Nate his former family. Her name was Martha Mary Haggerty. She was the daughter of Irish immigrants, orphaned at age seven upon the death of her father in 1886. Martha’s mother had died just months before. With help from Lalley.com, a phenomenal New Castle County (DE) website consisting of a major database of Catholic sacramental and death records, I was able to cobble together information about Martha's parents and siblings. I found death certificates at the Delaware State Archives and also an estate inventory of her father's belonging from the New Castle County Courthouse. I searched and photographed multiple homes tied to census record addresses, not necessarily located in today’s garden spots of Wilmington, Delaware. Martha, and five siblings certainly had a need to lean on their faith, as their parents died at young ages. I made another online query "connection" in 2007 with a lady named Nanci Murtaugh from the Philadelphia area. She is the granddaughter of Martha's older brother George and was able to shed some light on what happened to Martha's brother and three sisters. Martha was taken in and raised by an aunt and uncle. She would also live with another older sister, Katherine (Katie), and this would continue throughout her entire lifetime. The Haggerty sisters are seen on early census records working as seamstresses and taylors. Martha even allowed her sister to reside in her household after marrying Nathan Galloway in 1903. At times, this fact likely comforted Martha, or simply worked to enable Nate's frequent absences from the family. Regardless, "Katie" was there for Martha, and young William, through "thick and thin." Katie's particular importance for my grandfather, and great-grandfather Nate, must have come in 1925 with Martha's death at the age of 46. In December, 2007, I found my first visit to Martha's gravesite very ironic due to the fact that she is buried in Wilmington's Silverbrook Cemetery, the same eternal resting place of her former Galloway in-laws. They avoided each other in life, but in death are only about 30 yards apart. Through a videotaped interview with relatives, I learned that Nate continued co-habitating with his wife's sister Katie until her death in 1937. He would then move in with his son and wife Alice, much to her chagrin. Supposedly, he would antagonize her every chance he could. I eventually went in search Martha’s parents’ gravestones in 2008. The family was tied to the Cathedral of St. Peter in Wilmington, so I made an inquiry for help. This historic worship place serves as the “Mother church” to the Wilmington Diocese. I was answered back by a very kind and energetic gentleman named George Callahan, who served as the parish’s historian. George did some digging (paper, not dirt) and found that these ancestors (my great-great Haggerty grandparents) had originally been buried in St. Peter's old burying ground. John Haggerty died on December 21st, 1886, and George found a record showing that one day prior, on December 20th, Haggerty had purchased a burial lot for himself for $4. This was located in St. Peters cemetery located at 12th and Madison streets in Wilmington. I was excited to make the journey to St. Peter's Cemetery until George informed me that I couldn't go there. It had been paved over in the 1950's to be used as a hospital parking. The Diocese had sold the property to the hospital, I was floored...but have come to find that this kind of activity wasn't uncommon for churches of various faiths to do. Furthermore, controversy arose again in the 1990's when the hospital decided to expand onto the parking lot site and was forced to re-inter bodies from their former burying ground (under asphalt) to the nearby Cathedral Catholic Cemetery. Unfortunately for me, the stones, if any, didn't seem to make the trip, as both George and I could not find any sign or record of them. My only hope is that John and Isabella Haggerty, my GG grandparents, are actually in Cathedral Cemetery, even if it's only a mass grave. I cringe to think that they may be under the newly constructed Christiana Care Roxana Cannon Arsht Surgicenter. The name alone does not beckon a "Rest in Peace." I got the chance to return the "research" favor for my new friend George. He shared with me that he had roots connected to my home of Frederick County. His more recent Callahan ancestors had been residents of Tennessee and Virginia for generations, but had moved from the Franklin County (PA) area in the mid 1800's. Before going to Pennsylvania, they had once lived in the northern Frederick County area and could be found in the early Catholic area of Emmitsburg (in the first half of the 1800’s). This was particularly interesting because George told me a story of a particular ancestor named John Harrigan who had ties to the Key family of nearby Terra Rubra. This is the same Key family and estate tied to our local hero Francis Scott Key--author of the “Star-Spangled Banner.” John Harrigan's daughter Margaret (Harrigan) married Patrick Callahan in 1818, making him George’s 5G-grandfather. He was from County Cork, Ireland, born @1741. The Harrigans owned a large parcel of property in Harbaugh’s Valley named "Carolina" (between Emmitsburg and Sabillasville). Stories handed down in the Callahan family stated that Harrigan was at one-time an overseer for the Key family, and I was able to corroborate this! In looking at the time his ancestors lived here, along with Harrigan's involvement in the small Catholic community of Emmitsburg in the early 1800’s, I presumed that George's ancestor had to be acquainted with the famed French émigré, Rev. John Dubois, founder of Mount Saint Mary’s College. Today, Rev. Dubois can be found buried beneath the sidewalk in front of old St. Patrick’s Cathedral in New York City. More so, I delighted George with my theory that ancestor John Harrigan must have personally known Elizabeth Ann Seton, the first US born citizen canonized a saint by the Roman Catholic Church. This was fitting for both George and his home parish in Wilmington for one special reason tied to what this saintly woman did for the Catholic Church. 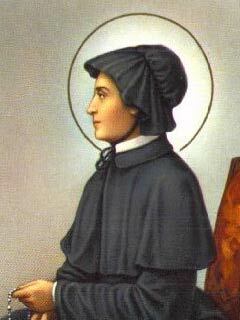 In Emmitsburg, Mother Seton had founded the first parochial school in this country, run by her community originally known as the Sisters of Charity of St. Josephs. In 1813, this group adopted the rules written by St. Vincent de Paul for the Daughters of Charity in France. George was all too familiar with these “angelic ladies,” as the Daughters of Charity had operated Wilmington’s St. Peter Cathedral School since the 1830’s. The school practically adjoins George’s church. Thanks to some record research, I found George’s relative John Harrigan in the Old St. Anthony’s Cemetery located atop Catoctin Mountain behind Mount Saint Mary’s University. This burying ground once surrounded St. Anthony’s, the first Catholic church in Frederick County, and western Maryland for that matter. I photographed John Harrigan's grave site and sent George additional pictures of the iconic “Mary on the Mountain” camponile (aka Grotto bell tower) which stands in the background of the mountainside burying ground. George was astonished and very gracious. It was a serendipitous meeting for both of us, and we had learned a great deal from one another about the pursuit of family history, and its many hidden rewards. Since that time, George had made a few trips to Frederick County to see both me, and conduct additional research at the Daughters of Charity Archives located in Emmitsburg. He was so delighted to touch his ancestor’s tombstone for himself, something that also always gives me pleasure on my ancestor quests. Since I couldn’t do so in this instance with my Haggerty ancestors, I lived vicariously through George’s Harrigans. In our last volley of correspondences, George was excited to tell me that he had gotten into the video arena, and was the star of a YouTube video on St. Peter Cathedral. Unbeknownst to me, the man who propelled my friend George into on-screen history was the Director of Communications for the Catholic Diocese of Wilmington--Robert G. Krebs. Before taking this job in Delaware, Krebs lived here in Thurmont (MD) just a few short miles from Emmitsburg and St. Anthony's Cemetery where George's ancestor John Harrigan and others once dwelled and now rest. And it was this same Robert Krebs who hired me for my first full-time job in the fall of 1989 after graduating from the University of Delaware, located minutes from Wilmington. I directly reported to Bob for nine years at Frederick Cablevision/GS Communications, Inc. where I would manage Cable Channel 10, a local origination programming channel. Like George, it was Bob Krebs who gave me the opportunity to produce historical documentaries and related programming. Sadly George passed away in August 2015 at the age of 88. George Callahan wasn’t a relative, but he made me feel like one. He also made me realize that the dots of our families are all around us, and spread throughout the country. It’s in our hands to do the connecting, and there are plenty of pleasant surprises, and people, out there who can assist us with the task.